now that halloween is done all i can think about is christmas & all the baking i plan to do! 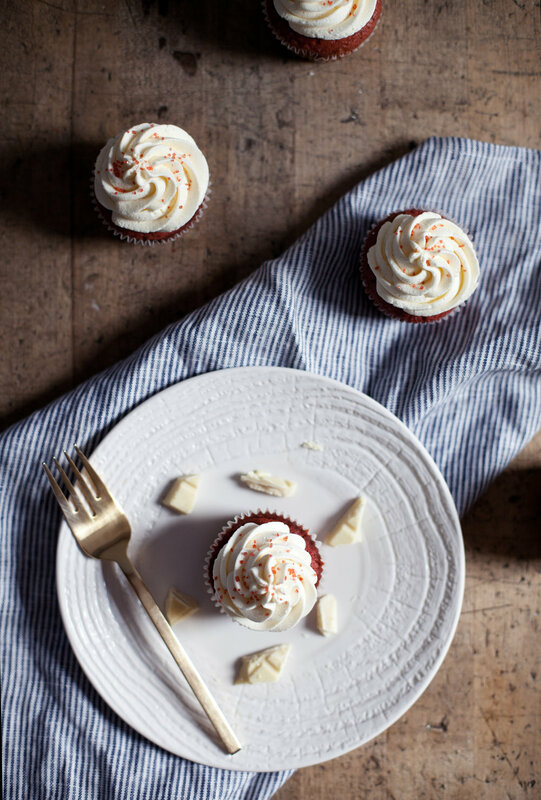 one of the treats that is always at the top of my list are red velvet cupcakes & cake. the deep red colour reminds me of the holidays & the richness of them is totally a winter comfort food. 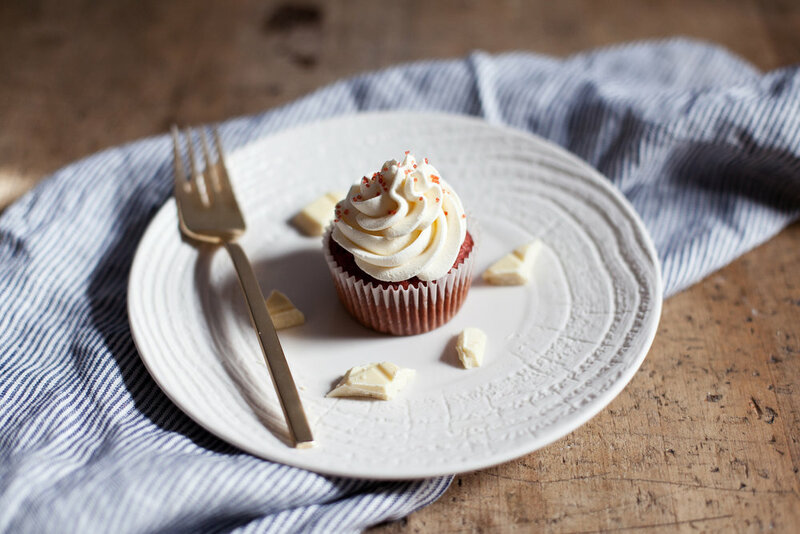 i have made red velvet so many times (one year i did a red velvet cheesecake, probably the most work i have ever put into one dessert) but something was ALWAYS missing from the recipe. that true red velvet taste i long for. that all changed when i came across the red velvet bakery emulsion from lorannoils. it is seriously genius! i can't get enough of it. 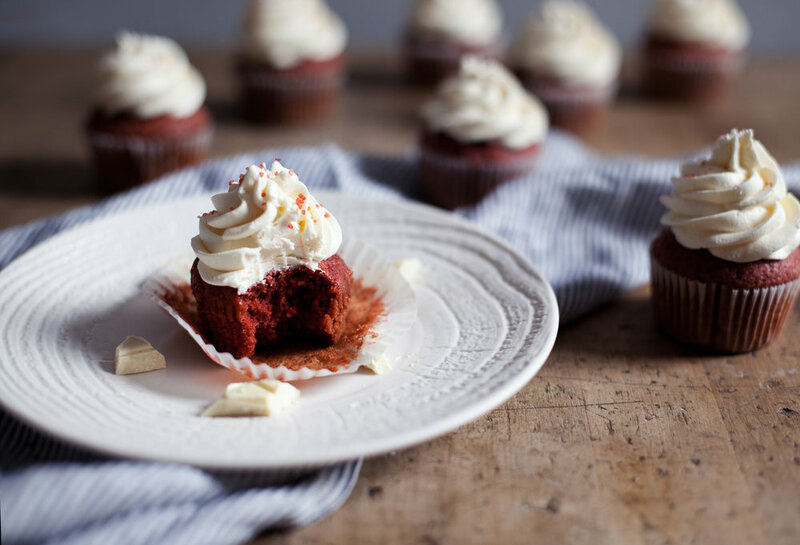 it gives an extra boost of the red velvet flavour we crave & provides the rich colouring as well so you don't have to go through containers of red food colouring to get the right colour. does any one else buy the primary food colouring pack & use the red up instantly? i have so many yellow, green & blue food colouring bottles in my pantry! the green only seems to come in handy around st. patrick's day. 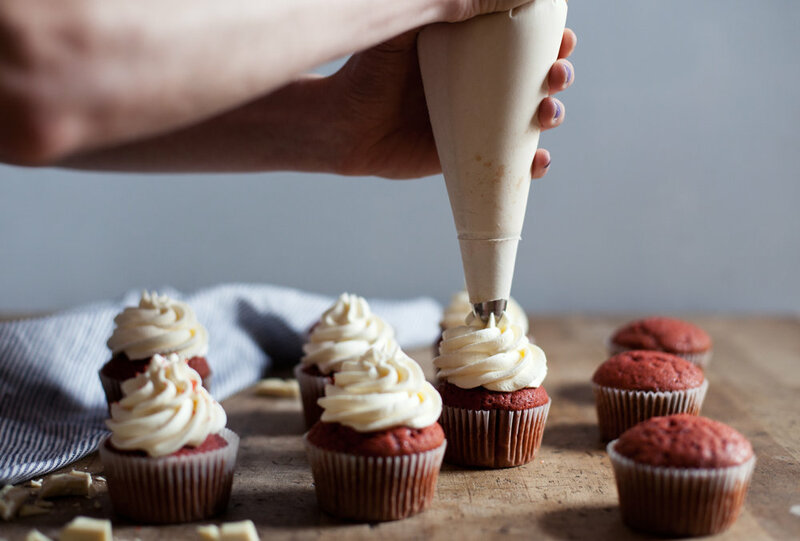 now this recipe can certainly be made into an 8-inch cake if you double it, but for festive gatherings i think cupcakes make so much more sense. people get to grab what they want & serve themselves! easy for the hostess & guest. plus, you get way more frosting if you pipe cupcakes as high as i do. when white chocolate is involved, you best not be skimpy! 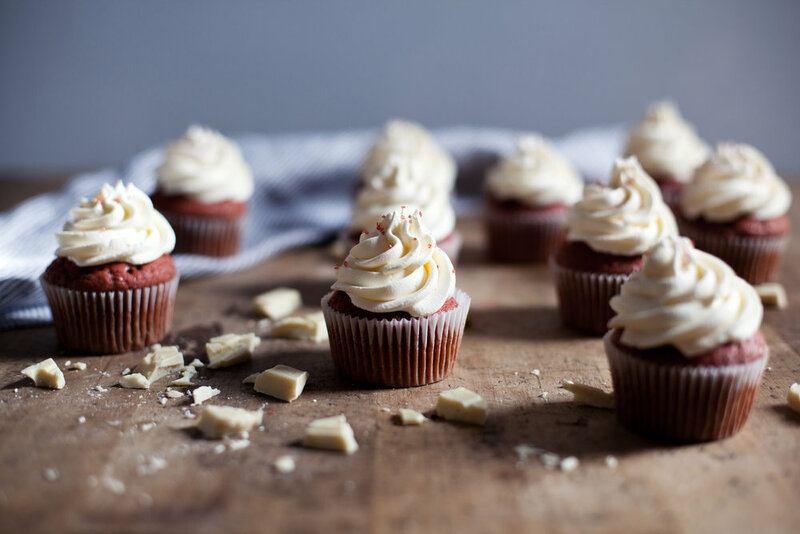 if you think red velvet cake must have cream cheese frosting, then try infusing some white chocolate into your favourite cream cheese frosting recipe too. just trust me & add that white chocolate. in a large mixing bowl sift flour, cocoa powder, baking soda & salt. set aside. in the bowl of a standmixer cream the butter & sugar. add the eggs one at a time followed by the oil & cider vinegar. rotate between adding in the buttermilk & the flour mixture until combined. finish off with the vanilla extract & red velvet emulsion. evenly distribute amongst lined cupcake tins. bake for fifteen minutes or until the cake bounces back to touch. let cool completely before frosting, about thirty minutes. in the bowl of a standmixer with the paddle attachment cream the butter & white chocolate until smooth. add the icing sugar one cup at a time & beat until light + fluffy. finish off by adding in the vanilla. 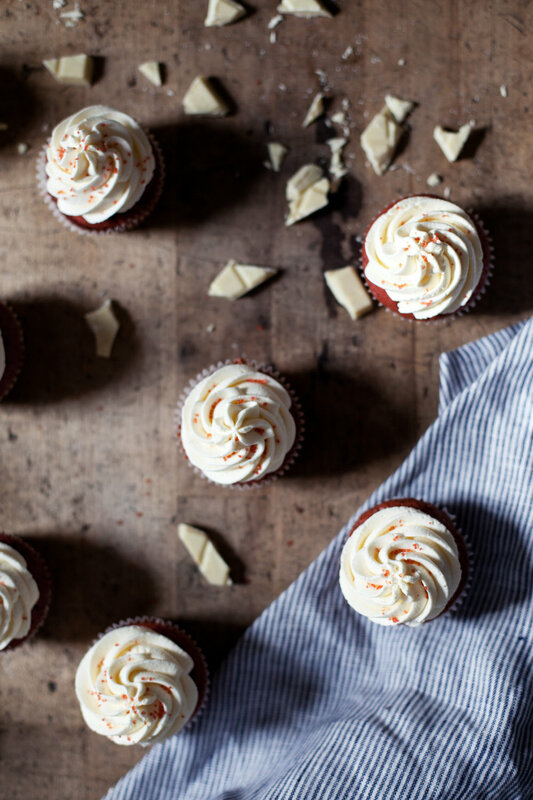 frost cupcakes as desired & sprinkle with a touch of red sugar.